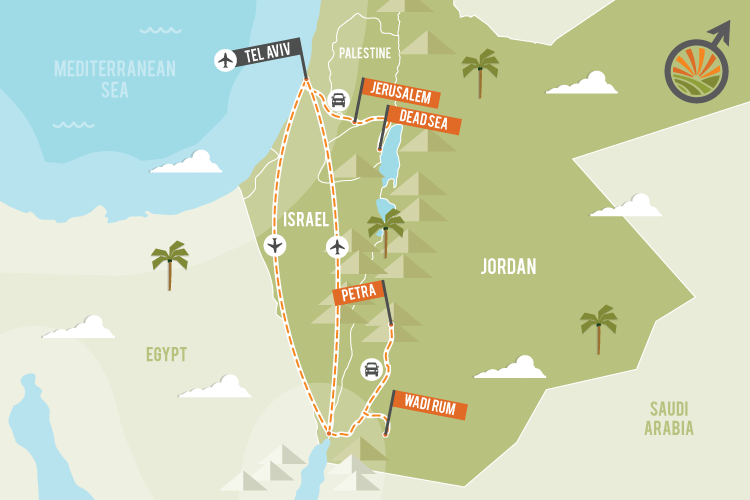 Your amazing, once in a lifetime 11 days in Israel & Jordan will take you to the heart of a region where around every corner is the unknown and unexpected. A wonderful mix of beauty, ancient ruins, vibrant markets, gorgeous beaches and natural wonders. What you may not expect is the array of cosmopolitan cafes which line some of the most stunning white sand beaches, or the giant golden dome of a local shrine rising over homes clad in Jerusalem stone or a 5th century masterpiece rising out of the Jordanian desert.... Your 11 days will bring you all of this and more! You may even find yourself on camelback riding through the desert or with a good book in hand as you float weightlessly in the Dead Sea or even sunbathing at the gay beach. Or you may find yourself exploring one of the country's world-class museums or soaking up the unique culture and traditions that can only be found in this Middle Eastern region. As part of the LGBT community this hosted group tour is the perfect way to take in the Middle East while enjoying the comfort of a relatively LGBT welcoming community. Days 1, 2 and 3 - Jerusalem. The largest city, capital city, and central hub of culture and history in Israel and one of the world's oldest and holiest cities. Day 4 - Dead Sea and Masada. You will head down to the lowest point on Earth, the famous Dead Sea, known for its unbelievably buoyant waters, the healing effects of its minerals, and the beauty of the surrounding landscape. Days 5, 6 and 7 - Tel Aviv. Less than 2 hours on the road is a world away as you arrive to the cosmopolitan beachfront city of Tel Aviv! Known for its liberal attitudes, beautiful beaches (including a gay beach), and nightlife. Days 8, 9 and 10 - Wadi Rum & Petra. A short 1-hour flight (included) takes you to the southern tip of Israel where you start your unforgettable Jordanian experience. Spend the evening at a Bedouin camp & sleep in a tented camp in the desert under a sky full of billions of stars. The following day you will continue your journey to the world famous site of Petra, built around 300 B.C. Accommodation. Please see below the approved accommodation to get an idea of the types of places you can expect to stay during your Israel & Jordan trip. Due to availability, these exact hotels may not all be available, however, we will always replace these with similar hotels and will never downgrade.